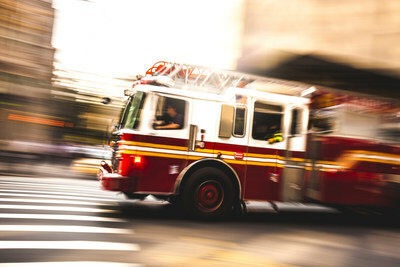 PORTLAND, Indiana, April 16, 2019 /PRNewswire/ -- Collisions involving emergency vehicles are a frequent occurrence across the world. Retro-fitting vehicles with safety camera monitor systems, such as Brigade Electronics' best-selling Backeye®360, allows drivers to keep a close eye on blind spots at the back and sides of their vehicle so they can instantly see other vehicles, cyclists or pedestrians. This intelligent four-camera technology is designed to eliminate vehicle blind spots and assist maneuverability in challenging situations by providing the driver with a complete 360-degree view of their vehicle in a single image. The system combines images from four ultra-wide-angle cameras, providing a real-time view on the driver's monitor. The result is a 'bird's-eye-view' of the vehicle and surrounding area. One major benefit of an MDR is its ability to support drivers who can often be the subject of increased scrutiny after an incident. The latest MDR systems, such as Brigade's, also have Wi-Fi and/or 4G connectivity, meaning that data can be live-streamed remotely with real time GPS tracking. Warning alarms are audible devices to alert pedestrians and workers when a vehicle is maneuvering. Unlike traditional 'beep beep' tonal alarms, which can be almost impossible to pinpoint, the latest technology creates a 'ssh-ssh' sound and uses smart technology to adjust sound levels in line with the ambient noise in the immediate vicinity. Utilizing a wide range of frequencies, smart reversing alarms also enable the listener to instantly locate what direction the sound is coming from. In adverse conditions, for example a noisy construction site, the warning decibel level will continually adjust 5-10 decibels above the ambient noise.